Microsoft Office 365 Study Guide Coming Soon! Get ready and prepared for your next certification! Microsoft Press published the new and upcoming titles for May 2012. On the certification platform one stands out for the Information Worker. 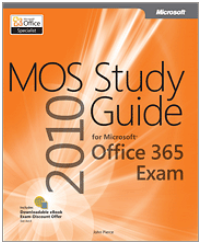 Next month you will be able to buy the MOS Study Guide for Microsoft Office 365. Joining the MOS Certification family this one should be on the list of to read for the coming period. Preparing yourself for the upcoming certification will give you that extra edge to ace this upcoming exam. MS Press have a good tradition in providing chapters you can read before buying this book. So keep a close eye on the MS Press blog here to see when the book gets published and when it hits the stores! Of course i will keep you posted here as well. This entry was posted in Books, MOS Certification, Office 365 and tagged MOS Certification, MOS Study Guide, MS Press Blog, Office 2010, Office 365, Study Guide on April 15, 2012 by Maurice.